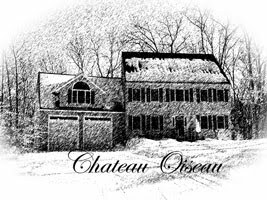 Chateau Oiseau: 2012 is THE YEAR for Chateau Oiseau! 2012 is THE YEAR for Chateau Oiseau! As anyone in the northeast USA knows, spring came early this year. We had weather in the 80° F range in March! All the vines went nuts, trying to push out buds. After a week of unseasonably warm and dry weather, temperatures went back down to normal (in the 40s and 50s) and the vines went into a kind of suspended animation where nothing happened for a few weeks. Then another couple weeks of unseasonably warm weather happened again in early April. We actually hit 91° F for a day! With very little rain, our local pond's water level was at least a foot low and I decided to put some light irrigation on the vines. As I sit writing this, we have had a solid day of rain from a passing "Nor'easter" that promises a very wet week ahead. We need the rain, but the timing isn't good, as the vines are leafed out and starting to produce flower clusters. Hopefully the flowers won't actually bloom for another week. 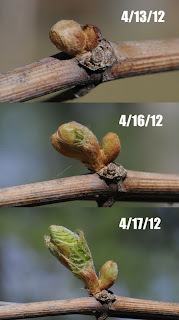 I have posted a picture of the buds on one of my Marquette vines popping out in only 4 days. It's really amazing to watch. If you compare the dates between this year and last, everything is a full 2 weeks early. 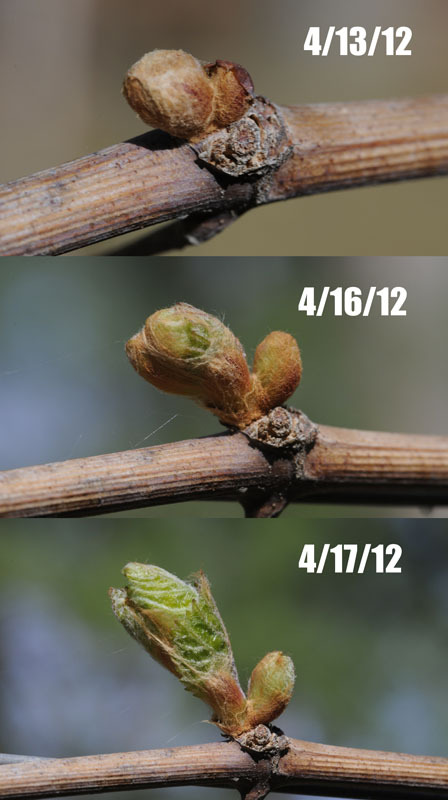 Spring is a busy time in the vineyard. I have spent the last few weeks removing buds and shoots from the trunks of the vines, spraying fungicide (very important to hit the vines in the spring with fungicide to control black rot), adding composted manure to the vineyard, and hoeing the weeds between the vines. I'm trying to reduce my use of chemicals like Round-up in the vineyard. Of course, going "organic" is largely impossible in the northeast as our humid weather simply breeds too much mold and mildew that needs controlling, and the insects will eat everything without some chemical interference. So hoeing the weeds is one small thing I can do rather than depend on Round-up. The good news is that I have 6 vines going into their 4th summer, and another 10 or so going into their 3rd summer. These vines all have tiny flower clusters forming and most are going to make grapes this summer! So with a little cooperation from Mother Nature and some gentle nurturing from me, I might actually make a batch of Marquette wine this year! This is exciting! Four years of hard work and expense and I can finally make wine from my own estate grown grapes! In the cellar, not much is happening. I bought an 8 gallon Vadai Hungarian Oak (same wood species as "French oak" but not made in France, hence cheaper) barrel in February and my 2011 spring Chilean Merlot is in there now. Small new barrels are famous for over-oaking the wine as they have a lot of surface area as a function of volume. Even though I put water in the barrel for a couple weeks to seal it up and extract some of the oakiness, I'm pretty sure the first batch of wine in there is over-oaked pretty significantly. On the flip side, this Merlot wasn't that great and maybe a little too much oak is just what it needs to cover its flaws! 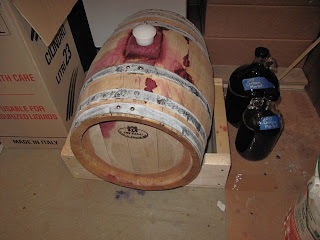 ;-) Once I bottle it (next month) I'll wash out the barrel and put my 2011 fall "Bordeaux Blend" in there. I don't want to brag, but this wine is actually good. Very good. With a little time in a barrel I think it might be awesome and the first wine I have made that I'm proud of. And just in time, because I have that Marquette to turn into wine this fall I hope!